Home » Sikh Martyrs » 1947 To 1966 Punjabi Suba » 1955 | Punjabi Suba Movement » Pics | 4 July 1955‬ Indian Police Entered The Golden Temple Precincts And Used Tear Gas To Disperse The Assembled Volunteers | 200+ Sikhs were Killed & 12,000+ Arrested during the Attack. 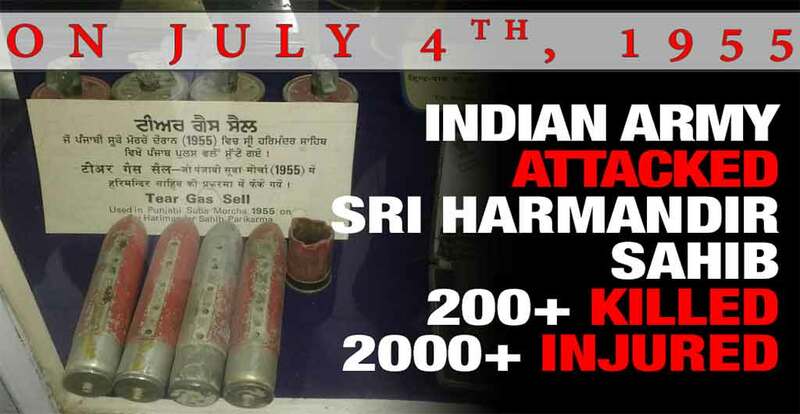 On July 4th, 1955 the Indian army started the slow extermination of SIkhs by lunching its first attack on our religious centre, Sir Harmandir Sahib. They believed they would get away with this crime. They believed we would forget our own history. They believed they would keep us slaves forever… but they were wrong!!! Today as more facts start to come out and more Sikhs learn the truth, the Indians know its only mater of time before we become an independent country!!! Referendum 2020 is our only way to peacefully liberate Punjab!!! Join the movement!! 4 July 1955‬ Indian Police Entered The Golden Temple Precincts And Used Tear Gas To Disperse The Assembled Volunteers | 200+ Sikhs were Killed & 12,000+ Arrested during the Attack. More than 200 Sikhs were Killed by the Indian Forces and more than 12,000 Arrested during the Attack. For more than 60years, Government of India had successfully Concealed these Facts from the Sikh Community. Only Solution to the Crimes Committed by Indians against the Sikh Community is Independence of Punjab. During the Punjabi Suba Morcha, Sikh protesters continued to grow in numbers. All the jails in Punjab had been filled and it had become increasingly difficult to contain the Sikh movement. Since the movement was started at Darbar Sahib, it was considered “headquarter” of all the operations and the government took strict measures to prevent Sikhs from going to Darbar Sahib. The police surrounded Darbar Sahib. No one was allowed to enter the premises without permission and having been searched by the police. Many Sikhs were arrested just on the basis that they were going to Darbar Sahib. It was naturally assumed that they were going to join the protestors. Even tourists were insulted and arrested. This brutal action of the police was more than enough to awaken the Sikh nation. They marched towards Darbar Sahib in large numbers and forced police to retreat and leave the vicinity of Darbar Sahib. Finally, it was decided to crush the movement by all means necessary. Ashwani Kumar, DIG of Jalandhar police, asked for permission to practice unlimited privileges and promised to destroy the movement within 5 days. Upon getting the permission, he ordered the police to confiscate handguns, rifles and all other firearms kept by SGPC, Censorship was put on Sikh newspapers disallowing them to highlight the truth and educating the public of the real situation. The police stopped printing of the newspapers and closed down the main buildings. Many Sikh journalists and news reporters were arrested. Printing press was stopped, confiscated and all of the printed material was burnt by the police. It was all part of the plan so that no one would know the extent of the police operation and the mass public will stay uninformed. After disarming the Sikh leadership, the police started its operation. First, Darbar Sahib was surrounded by thousands of policemen and the public was stopped from going in and out of the complex. Then all the rest houses were searched and everyone found was arrested. All of the political members and leaders within the vicinity of Darbar Sahib were arrested and taken to jail. Everything was searched in the SGPC office. Then the police moved to Manji Sahib. When the Sikhs protested they were met with heavy sticks and tear gas. By this time the police had fortified every building standing outside of the main complex and started to throw tear and poisonous gas at the Sikhs. Then the police entered the main complex with shoes on and fired upon the Sikhs that had gathered there to protest peacefully. Many bullets were fired at the main building and Akal Takht Sahib. All the religious activities such as Kirtan and Akhand Paath were stopped and every Sikh including women was insulted, beaten and then arrested. This was all done to immobilize the Sikh movement. The police kept full control of Darbar Sahib for four days. July, 1955, the Government of India ordered police to enter Akal Takht and the Golden Temple Complex. Jathedar Achchhar Singh, Jathedar of Akal Takht, along with many others were arrested. The Police used tear-gas and firing in the premises. Instances of government high-handedness and interference continued increasing. More than 3000 Sikhs were arrested including many of the leaders and employees of SGPC. Several hundred including women and children were injured. The backlash was immediate; so severe were its effects that the chief minister, Bhim Sen Sachar, presented himself before the Akal Takht to apologise for the trespass.